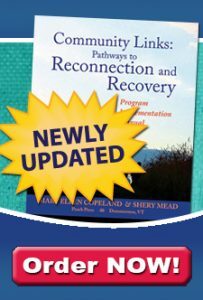 I had read about WRAP many years ago when I read a book about Fibromyalgia co-authored by Mary Ellen Copeland. It seemed like a good idea. I took parts and applied to my life but didn’t formally adopt the program. In June of 2003, I became a widow. I was faced for the first time with the situation of not being supported. After the initial shock, I began thinking that maybe I could work part-time. I had many ups and downs over the next 2 years dealing with the grief, raising my children and working with my mental and physical illnesses. I attended a psychosocial rehabilitation program near my home off and on. I also volunteered at different recovery groups on several committees as a way to learn about recovery and supplement my income. In June of 2004, I ended up in the hospital with severe depression. I was reintroduce to the WRAP when a medication group viewed the WRAP tape. It started to come back to me. I worked with one of the staff to develop a WRAP notebook. I felt empowered and started to climb out of my depression. In September of 2005, I had the opportunity to participate in a 2 day workshop with Walter and Carol from Ohio. I was also attending a 16 week long training to become a Peer Specialist and attending the local Community College part-time. It was a full plate. I was stretching my wings as far as I could. In October, 2005, I was picked to attend a week long training with Walter and Carol to become a facilitator. I took a week off school. The pace of all this was intense but I thought that with my WRAP plan I could do it. Midweek I started to get a respiratory illness. Just having a WRAP plan wasn’t enough. Several weeks later I ended up hospitalized for a week. I wrote another WRAP plan while in the hospital, using the tools to figure out what went wrong and to plan another strategy. Writing the WRAP while I was in the hospital allowed me to feel as if I was in charge of my health for the first time. I shared my WRAP plan with anyone who came into my room and would listen! Telling it over and over helped cement it in my mind. After 6 weeks at home, I returned to school and my other training. I was determined to try and get out of the dry dock. I thought keeping my WRAP plan in my head was enough. In December of 2005, I ended up hospitalized again for depression. I brought my WRAP plan and again looked back to see where I went wrong. I made another plan. Again, I talked to everyone I could about it. I showed it to all my doctors. I was out in a week this time. 2006. I started back to school. I am also part of my agency’s WRAP team. We planned to do an 8 week session for one of our residential sites. In January, I met with my new psychiatrist and introduced him to WRAP and talked about how this was going to help keep me well. I was stared on some new medication. In February I started to get sick again. I was anxious beyond belief. I was having a lot of physical symptoms as well. A lot of snafu’s were happening in terms of my switching over to community mental health for therapy and scripts. I kept to my WRAP plan to help me feel in control. I couldn’t understand why I was getting sick again. I finally got to see the doctor and he told me I was having a reaction to the drug. Because I had a WRAP plan, I was able to stay out of the hospital! I rewrote my WRAP plan again, tweaking it. After a couple of months, I began thinking about working again. I began making plans with my coach about how to go about it. I wrote a WRAP plan for this goal. My team is planning another WRAP session August 1st, 2006. I plan to be there this time. Having a WRAP plan is about writing and following it, but it is also about showing your treatment team that you are serious about being an active part, a proactive part. Having a WRAP plan helped me to talk to those on my treatment team, helped me to feel empowered. It gave confidence; ground to stand on. It is like having a diploma from the prestigious school of hard knocks. Professionals respect it. They respect me. I respect me.